Patrick Cutrone scored the only goal in extra-time as AC Milan knocked city rivals Inter out of the Coppa Italia. The 19-year-old struck with a crisp finish after a precise through ball from former Liverpool man Suso. Inter thought they had scored when goalkeeper Antonio Donnarumma turned Ivan Perisic's effort into his own goal but it was overturned by the video assistant referee for offside. Gennaro Gattuso's side will now face Lazio in the semi-finals. Mauro Icardi had scored a hat-trick as Inter won the first derby of the season 3-2 but on Wednesday night Milan bounced back from consecutive defeats. Milan's third-choice goalkeeper Donnarumma was making his debut after older brother and first-choice Gianluigi was ruled out through injury and Marco Storari pulled up in the warm-up. 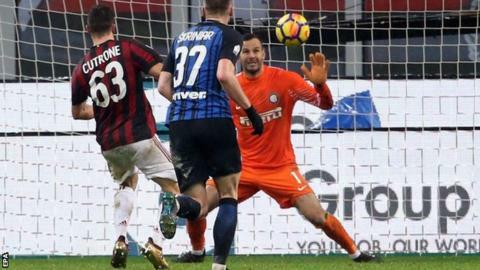 Donnarumma kept his side in the contest with crucial stops, keeping out Perisic and Antonio Candreva late on in normal time, before Cutrone netted the winner.